In the 1970s and ‘80s British Sci-Fi comic ‘2000AD’ introduced some of the most iconic stories and characters to readers of comic books, and none more so than the demonic-like alien, ‘Nemesis the Warlock’. From the creative mind of writer Pat Mills, this part-space opera epic, part-political commentary, began with a one-off story told in a weekly comic strip entitled ‘Terror Tube’ (1980), inspired by the album ‘Going Underground’ by the British rock band, the Jam. It showed the struggle between a mysterious ‘freedom fighter’ (Nemesis) and the totalitarian rulers of a far future Earth, where the human population was confined to a vast subterranean city called Termight, the empire of which was in a state of perpetual war with the non-human civilizations of the Galaxy, and ruled by a fascistic government, the Terminators, who mixed religion and politics into a single state ideology. The story was an instant hit, as under the hand of Mills’ frequent artistic collaborator Kevin O’Neill some of the most fantastic and intricate comic book artwork of the last thirty years was created. Along with the central anti-hero of the tale, Nemesis, was his arch-enemy Tomas de Torquemada, named after the historical Spanish inquisitor of the same name, head of the feared Tube Police and the Terminators, the ruling party of the Terran Empire, whose distinctive dress and symbols were deliberately modelled of the look of the United States’ infamous Ku Klux Klan (KKK). Both became iconic characters and their deadly struggle allowed Mills to explore themes of racism, totalitarianism, religion, revolution and contemporary Cold War politics and beliefs, as he created an Earth at war with the Galaxy in a xenophobic crusade of devout intensity. The stories were dark, violent and often with a biting satirical edge and black humour born of Mills’ left-wing beliefs. The first story was quickly followed by a second, ‘Killer Watt’ (in September 1980), and eventually reader demand led to a series proper, ‘Nemesis the Warlock ‘ beginning with ‘Book 1’ in 1981. In this and later stories the ‘Nemesis’ universe was slowly teased out, growing far beyond the original concepts, combining elements of science-fantasy and sword and sorcery in a Galaxy spanning, Sci-Fi epic. However, initial excitement at this new venture turned to mild disappointed as ‘Book 2: The Alien Alliance’ (1982) proved to be something of a let-down for many, as it was largely used to fill out the imagined universe and back-stories of the main characters, with mixed results. This feeling of disappointment was also in part attributable to a new artist being assigned to the series, Spanish illustrator Jesus Redondo, whose rather conventional artwork was felt by some to jar with the more twisted imagination and tone set by O’Neill. ‘Book 3: The World of Nemesis’ (1983) was a massive return to form, and a relief to many, as Mills went back to the more successful elements of the initial stories, while O’Neill was again the man behind the pen, this time displaying an astonishing imagination and creative ability that for the vast majority of readers became the defining ‘look’ of the series as a whole. It also saw the surprise return of several fan-favourite characters from other 2000AD stories, tying them into the time-line of the Terran Empire, a sort of ‘cross-over’ theme that was to grow in later stories. While Kevin O’Neill had become the one and only artist for most ‘Nemesis’ followers, the exquisite detail of his illustrations made for a slow production rate and disagreements with 2000AD’s editorial team, along with the offer of greater financial security with US-based publishers, led him to move away from the series for many years. Widespread disappointment amongst readers was somewhat abated with the arrival of ‘Book 4: The Gothic Empire’ (1984), which saw the arrival of a new artist, Bryan Talbot. 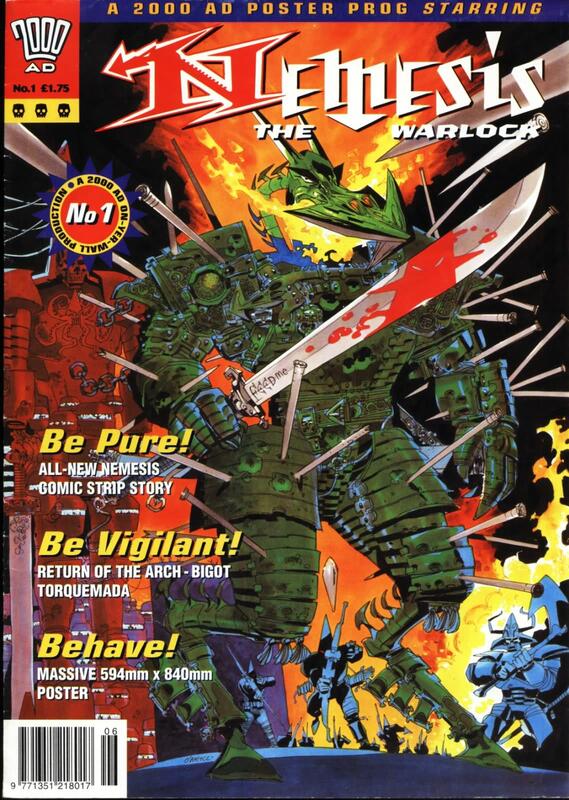 Though stylistically very different from O’Neill, Talbot’s skill and imagination earned him praise among long-term fans and critics alike, and the power of ‘Book 4’ as whole, with its gothic, steampunk elements and the inclusion of several hugely popular characters from another 2000AD hits series of Pat Mills, ‘The ABC Warriors’, led to the series gaining multiple awards. Over the next few years more episodes followed in one of the longer narrative arcs in comics’ history, including ‘Nemesis Book 5: The Vengeance of Thoth’ (1985) and ‘Book 6: Torquemurder’ (1986 – 1987) both drawn by Talbot. Yet it was becoming evident to many that the heyday of the series was perhaps over, and it was on a slow but steady decline, as the story ideas became increasingly threadbare or incoherent. ‘Book 7: The Two Torquemadas’ (1987 – 1988) and ‘Book 8: Purity’s Story’ (1988) had little to recommend them, and reader reaction was at best lukewarm, with a stream of new artists leaving little visual continuity in the series, which had been one of its greatest strengths. However the absolute nadir was undoubtedly reached with the surreal and utterly self-indulgent ‘Book 9: Deathbringer’ (1988 – 1989), where writer Pat Mills was more or less given free rein to his imagination, and his politics, with dire results. What started out as a tightly edited, creatively inspired narrative complimented by some of the best illustrations to ever grace the pages of a comic book, in the end had become a chaotic, overblown, mess. A ‘prologue’ to ‘Book 10’ followed in 1994, but another five years passed before Mills returned to the sequence proper, producing ‘Book 10: The Final Conflict’ (1999), as he tried to tie up all the loose ends of the overall story – largely successfully, if with little dramatic effect or satisfaction. Several other stories set in the ‘Nemesis’ canon, spin-offs or specials, were also published in the years between 1980 and 1999, though of various significance and quality, and they too featured different artists. However, as is often the case with a comic series stretching across many years (and a largely unprecedented two decades in the case of ‘Nemesis’), even when one writer is behind it all, different artists and the changing attitudes of the writer make for a very uneven output, and it is the earliest stories of ‘Nemesis the Warlock’ that remain the most worthy of reading, and enjoying. For an entire generation of comic readers in the 1980s the earliest stories of ‘Nemesis the Warlock’, the mysterious anti-hero, with his demonic persona, became the very symbol of rebellion and anti-authoritism. His image was to be found on a thousand tee-shirts, his motto scrawled on a thousand school books, and he remains to this day a symbol of resistance held in affection by many, who rightfully forget the later mess created of this great comic icon.